Panama isn’t the only country that will host World Youth Day pilgrims in January. Dioceses in Nicaragua and Costa Rica — the closest neighbor to Panama City, the site of World Youth Day, Jan. 22-27 — are preparing to receive up to 30,000 young people as part of the traditional Days in the Dioceses leading to the main event. Father Miguel Adrian Rivera, executive secretary of youth ministry for the Costa Rican bishops’ conference, said parishes are planning to welcome pilgrims for catechetical and cultural events. 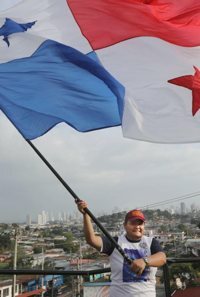 “In Panama, as a small country, they considered the eight dioceses of Costa Rica and the eight dioceses of Nicaragua” stops that the young pilgrims can join in preparation for World Youth Day, Father Rivera said. The eight dioceses of Panama also are participating in Days in the Dioceses. Each diocese has a priest overseeing activities that include finding host families, introducing guests to the community and providing information about tourist attractions pilgrims can enjoy. At the end of the week of preparation each diocese will have a massive youth event with the local bishop before sending the pilgrims to Panama, Father Rivera said. Bishop Jorge Solorzano Perez of Granada, Nicaragua, president of the bishops’ Youth Ministry Commission, announced in April that dioceses in his country were preparing for more than 15,000 pilgrims for Days in the Dioceses. Special security arrangements are being undertaken in Nicaragua, which has experienced rounds of anti-government protests in recent months, Father Rivera said. Costa Rica has created an inter-institutional commission that includes the police, Department of Foreign Affairs, Department of Immigration, and National Emergency Commission to facilitate the passage of pilgrims and the safety of the young adults for as long as they are in the country, Father Rivera explained. The priest noted that each of the three countries has different cultural characteristics and faith practices. “In Costa Rica, youth ministry is very dynamic; in all the parishes there is a youth ministry,” he explained. In the parishes of the Diocese of Cartago, local young people plan to share with pilgrims the tradition of popular Marian piety, which is based on a devotion to the patroness of the country, Our Lady of the Angels. Parishes of the city of San Jose, the Costa Rican capital, planned for pilgrims to experience university ministry and the process of education in the faith. If pilgrims from any part of the world decide to choose one of the parishes of the Diocese of Limon, on Costa Rica’s Atlantic coast, they will experience how the church ministers to tourists and indigenous people. The Panamanian government has announced that there will be improved in transportation to facilitate the influx of pilgrims and that the normal $60 fee for consular and migratory services will be waived for pilgrims. Rojas writes for San Francisco Catolico, the Spanish language newspaper of the Archdiocese of San Francisco.